Elizabeth has a new job at an unusual library – a lending library of objects, not books. In a secret room in the basement lies the Grimm Collection. That’s where the librarians lock away powerful items straight out of the Brothers Grimm fairy tales; seven-league boots, a table that produces a feast at the blink of an eye, Snow White’s stepmother’s sinister mirror that talks in riddles. Elizabeth is the new kid in a school, and has difficulty making friends. She’s quiet and a bit shy with a crush on the school’s star basketball player Marc. After doing a report on the Grimm Brothers, she’s pulled aside by her social studies instructor and is offered an after school job with the New York Circulating Materiel Repository– a library that loans patrons items, not books. There are four main characters in the story: Elizabeth, the quiet new girl. Anjali the beautiful girl who has the attention of both Marc, the basketball star, and Aaron the surly boy who knows a little more than he should. The adults play a strong supporting role, often not so subtly nudging the kids in the right direction. The magic aspect of this story is really interesting. Anjali has the ability to use magic, Elizabeth can smell it, and Aaron can see it on certain objects. The biggest pull of this story is the Grimm collection, which are items directly out of the Grimm Brothers’ fairy tales. 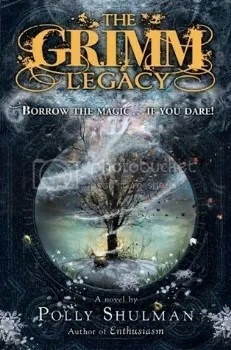 The Grimm collection is secret, well guarded and only a select few can get into it. Halfway through the story, Elizabeth is granted access, which drove me a little crazy. The build up toward the Grimm collection was so high, so mysterious that it was almost blase when she did get into it. She and her friends are thrust into the middle of a mystery when they figure out that magical items are disappearing, or being returned stripped of their magic. They decide to go off on their own to find the person who is responsible. There are a few things that go wrong with this plan, and people aren’t who they say they are. There’s almost too much going on in this book. The mystery of disappearing items would have been enough to carry the novel I think. The Grimm collection was something original, and I liked the concept of the library of borrowing items that weren’t necessarily books. I mean who wouldn’t want to go grab something from history and look at it? I know given the chance I’d spend many days there getting lost in history and looking at items first hand. But then the author throws in a magical bird that’s coming to attack the kids who work at the library, a collector of dolls that aren’t dolls, two really weird and unnecessary romance plots and disappearing adults at pivotal times in the story. The romance and crushes were overwrought and caused drama that didn’t need to be there. I was rolling my eyes a bit when it came to certain chapters. Elizabeth grows as a character only superficially. Overall It’s aimed toward the high school/YA audience but it reads really young. Almost middle grade. Interesting concept that gets lost in too many details and random plot twists. I won’t be picking up the companion novel.